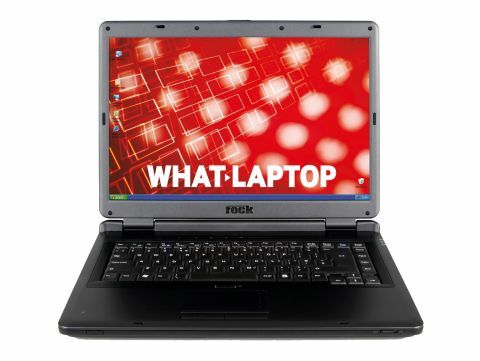 With a growing reputation in the UK as a manufacturer of reliable gaming laptops, Rock offers systems for users with a greater need for mobility and power. Providing compact dual-core performance is the Rock Pegasus 660 (£999 inc. VAT). With a weight of 3.1kg, the Pegasus has a degree of portability, but there are lighter machines available. Unfortunately, a low battery life limits usability. The Pegasus lasted just 134 minutes under test conditions before needing to recharge. At a little over two hours, this will get you through the average meeting, but isn't ideal for the frequent traveller. More useful for the traveller is the strong keyboard, excellent screen and features geared towards usability. Spanning 307mm of the chassis' 360mm width, the keyboard is comfortable even for long periods of use. Equally, the 15.4-inch Super-TFT screen is bright and sharp. Aiding day-to-day use, a bank of media hotkeys sit beneath the screen, allowing one-touch access to Internet, email and multimedia. A silent-mode button also lets users cut both cores of the 1.83GHz CPU to just 1GHz at will, which stop the fans spinning for quieter performance. When running at full speed, both cores of the Intel Core Duo T2400 processor provide power. However, the Rock only has 512MB of DDR2 memory. This clearly showed in testing, where its score of 206 points from MobileMark 2005 tests is disappointing for a dual-core laptop. The gaming power of the laptop is better - not surprising considering Rock's core market. Using an nVidia GeForce Go 7600 chip for graphics, 3DMark 2003 tests produced a score of 7772 points. So gamers can continue gaming on their travels. Connectivity is kept to a minimum, which was expected for such a small chassis. However, the essentials are in place, such as three USB 2.0 ports and a DVi-out for use with an external digital monitor/projector. High-speed networks can also be joined via Gigabit Ethernet and 802.11a/b/g Wi-Fi. If gaming is your main focus, then the Rock Pegasus 660 could make the ideal travel partner, thanks to its small chassis and strong 3D performance.